Welcome to the Dungeon Keeper Promo Art page! Here you can find some artwork collected and saved from around the web and the real world that was used to promote the Dungeon Keeper games. Some of this material is getting very hard to find as older DK sites continue to disappear, so this is an effort to archive and preserve it. Feel free to take any of these images and use them for your own purposes. These are a couple of low-res renderings from an early version of the now familiar Dungeon Keeper intro movie that were released as preview/promo material. As you can see, one interesting difference is the Wizard in the bat fly-by scene rather than the Knight who is there in the final version. Here is one of the most common ads that was used to promote the original Dungeon Keeper. It could be found on various fan sites a few years ago, and may still be floating around the net. These graphics were used on Bullfrog's site and some other places to promote Dungeon Keeper 2 prior to and just after launch. These may not be available anywhere else now that Bullfrog has dissolved and their site is gone, so enjoy! 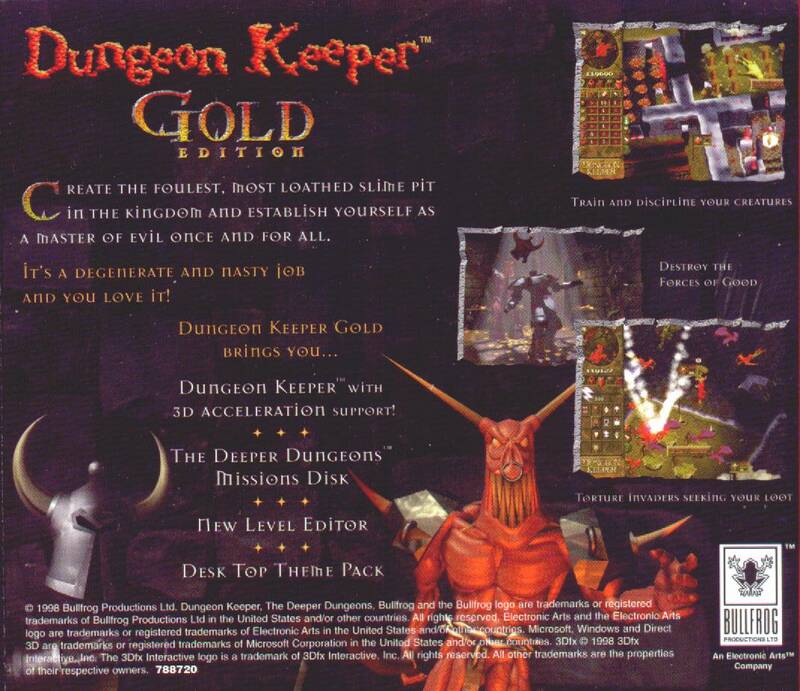 Here are some scans of the inlays from the Dungeon Keeper Gold CD, which has been out of print for several years now. 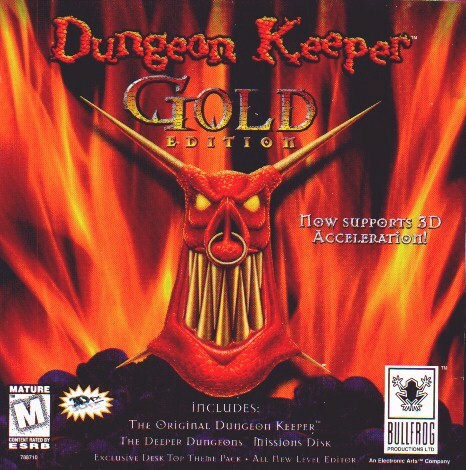 It was inarguably the best release of the original game, coming with the Direct3D-accelerated and normal software versions for Windows, the DOS version, the Deeper Dungeons expansion pack, a desktop theme, the official level editor, and some other hidden goodies on the CD. These are only thumbnails; click on the images to see a hi-res version.